Associated Press In an image from television news footage, flames consume the roof of a home in Lawrence, Mass., a suburb of Boston, on Thursday. LAWRENCE, Mass. 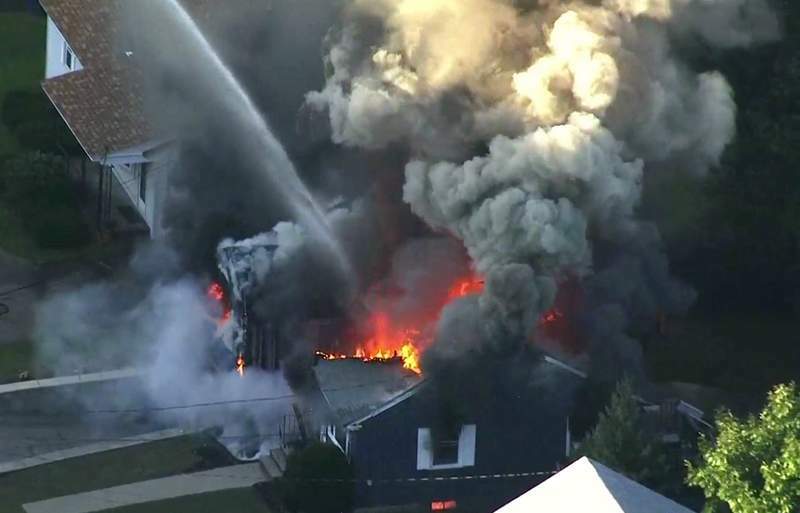 – A series of gas explosions an official described as “Armageddon” killed a teenager, injured at least 10 other people and ignited fires in at least 39 homes in three communities north of Boston on Thursday, forcing entire neighborhoods to evacuate as crews scrambled to fight the flames and shut off the gas. “Our thoughts are with everyone affected by today's incident,” Indiana-based NiSource said in a statement. By late Thursday, all the fires had been doused, but many areas remained silent and dark after residents fled and after power companies cut electricity to prevent further fires. Schools in all three communities were canceled for today, and some schools were being used as shelters for residents. Lawrence resident Bruce Razin was among the evacuees standing outside the Colonial Heights neighborhood near the city's high school trying to decide what to do late Thursday. Officials had cut power in the area and the streets were pitch black, save for emergency vehicle lights. Razin said he arrived just as residents were being evacuated and immediately saw that the house two doors down was leveled from an explosion.